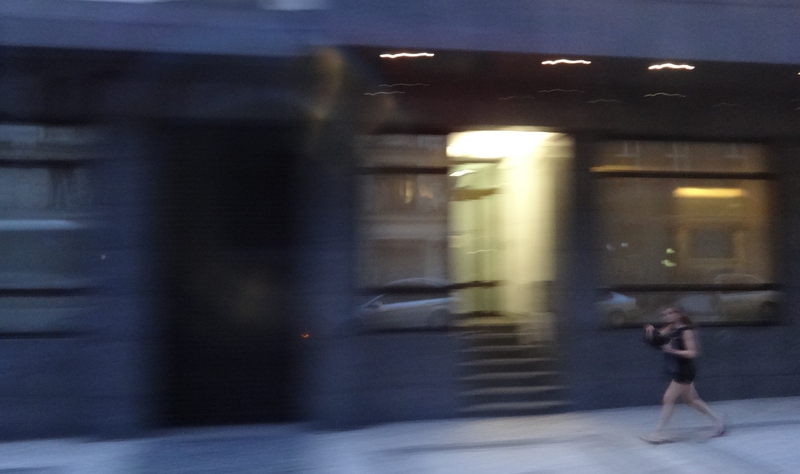 « Moving through the Sudetenland, to Prague. 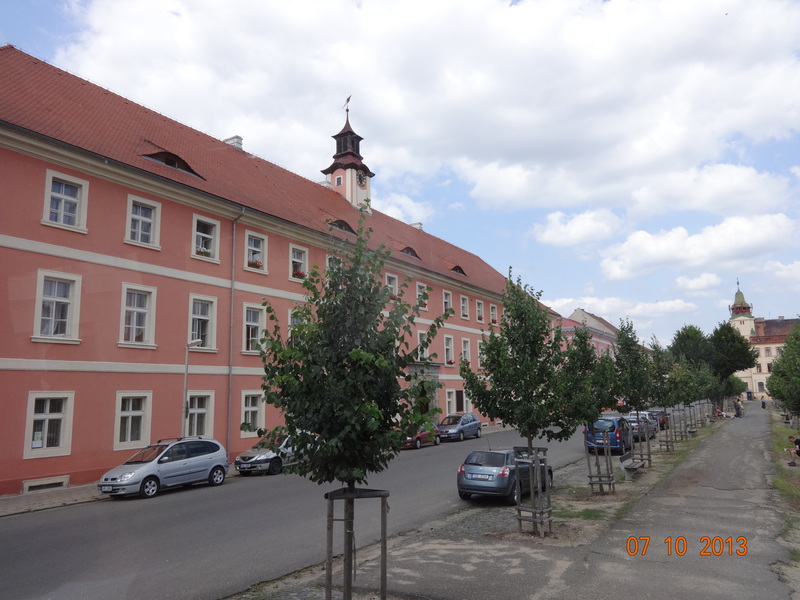 Theresienstadt- “Spa town”. The real Holocaust hoax. July 10. Life goes on. But stop and wonder. 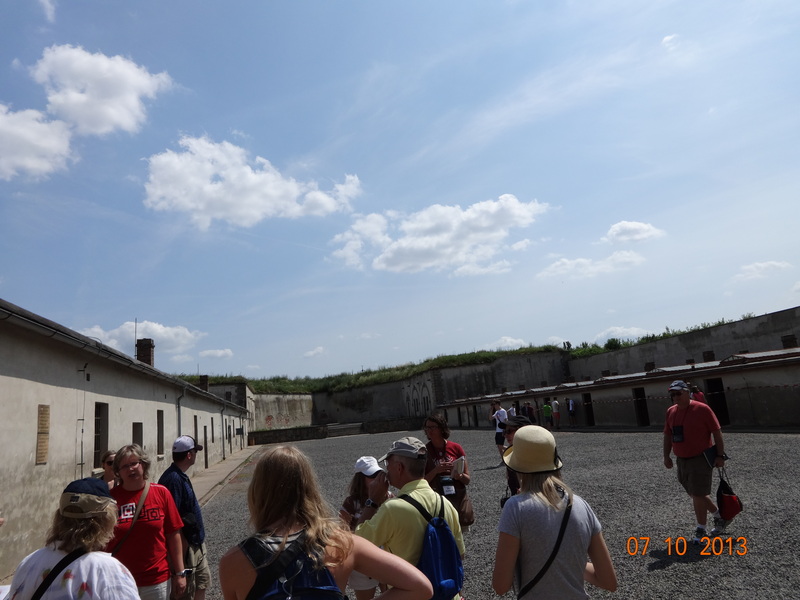 Now the tour continues to Terezin, or Theresienstadt. 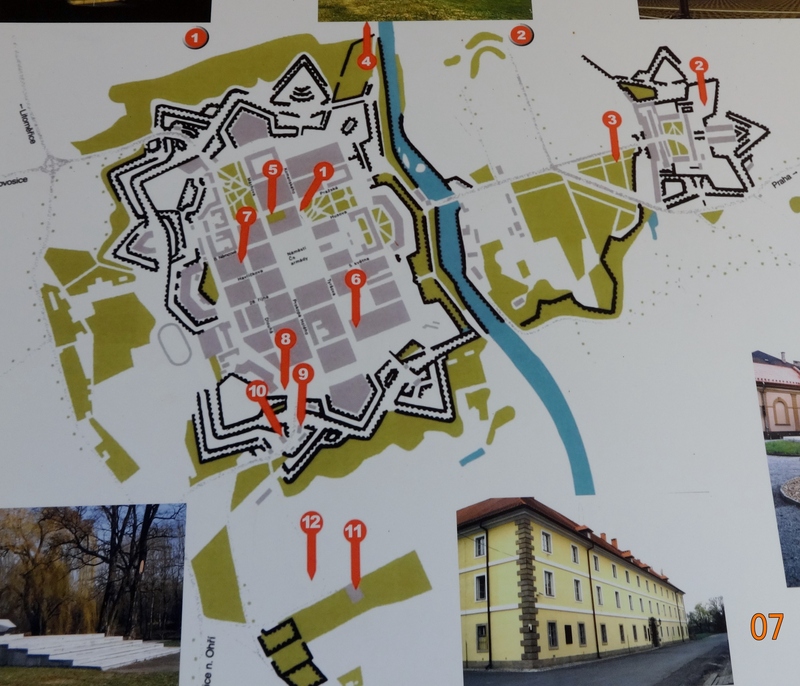 Forty miles north west of Prague and originally built in the late 18th century as a fortification and garrison town by Emperor Joseph II and named after his mother, Empress Maria Theresa. I will be at the site where the “Train Near Magdeburg” was destined to arrive-but never did, thanks to the US Army. But why there? 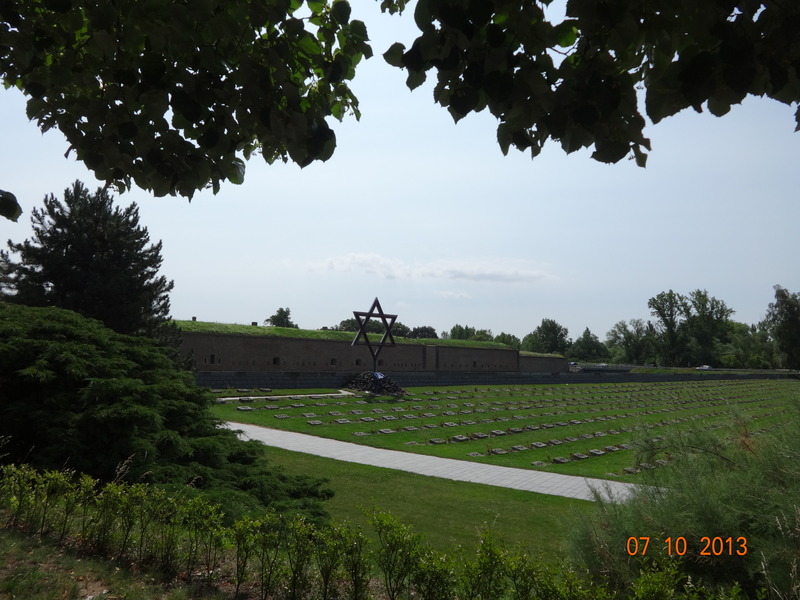 Terezin. Garrison town and later ghetto, and Small Fortress, later prison. 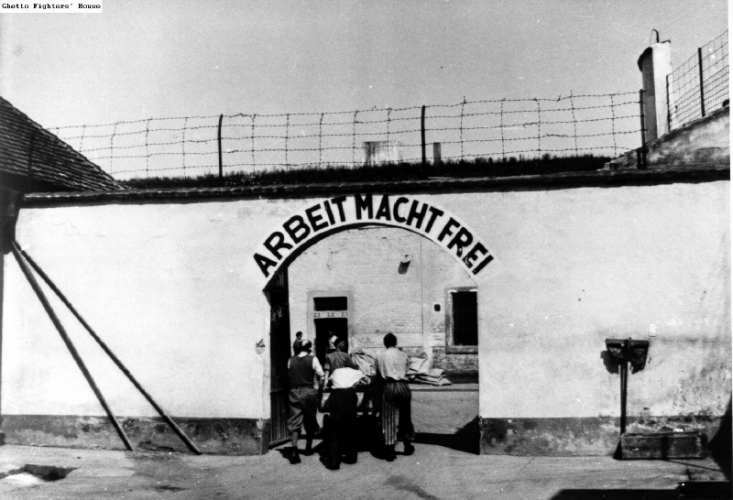 In the closing days of the war, as the Reich collapsed in the East, and began to be rolled up in the West, Theresienstadt was the destination of the three transports hastily evacuated from Bergen Belsen. As stated earlier, only one train made it there, but we have never heard of what happened to the occupants. 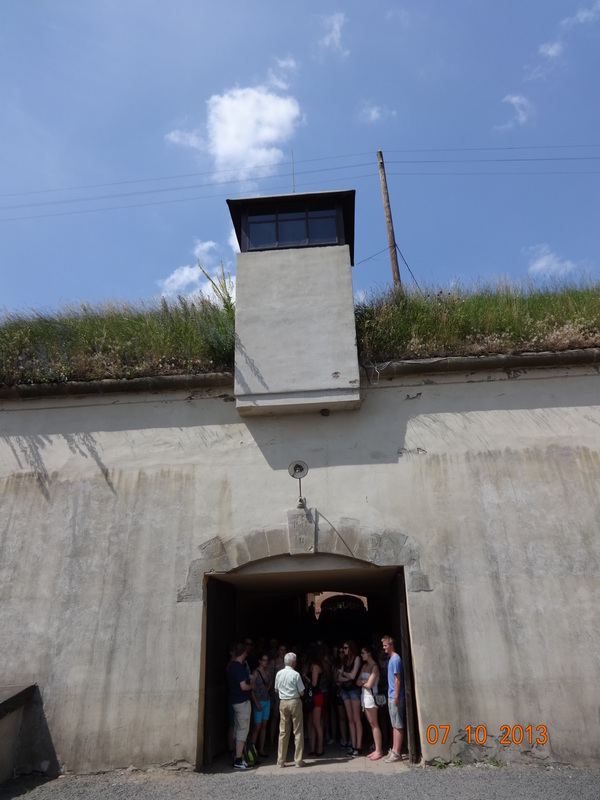 It is known that as thousands of prisoners from other camps flooded into Theresienstadt in the last month or so of the war, typhus and other epidemics broke out . 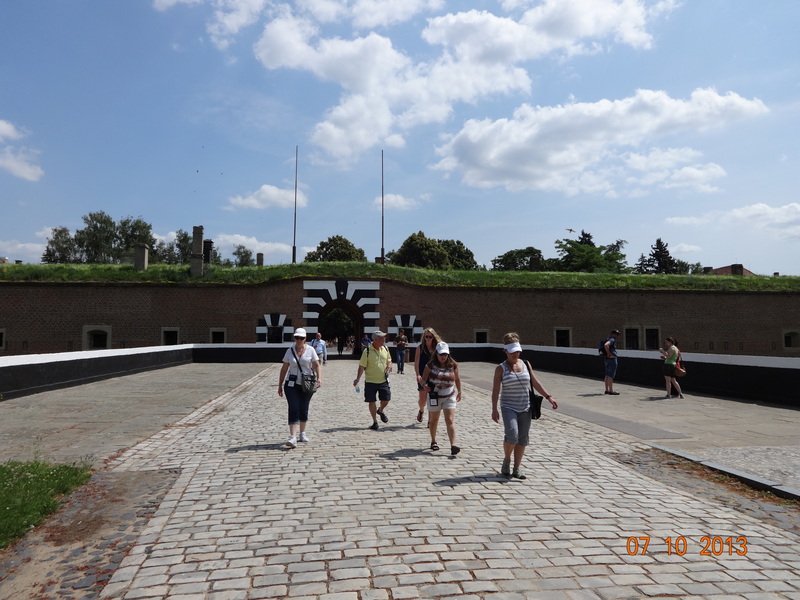 First we toured the Small Fortress, later the prison. Inside the Small Fortress. That horrible sign again. Inside the Small Fortress. The place is crumbling. Inside the Small Fortress. 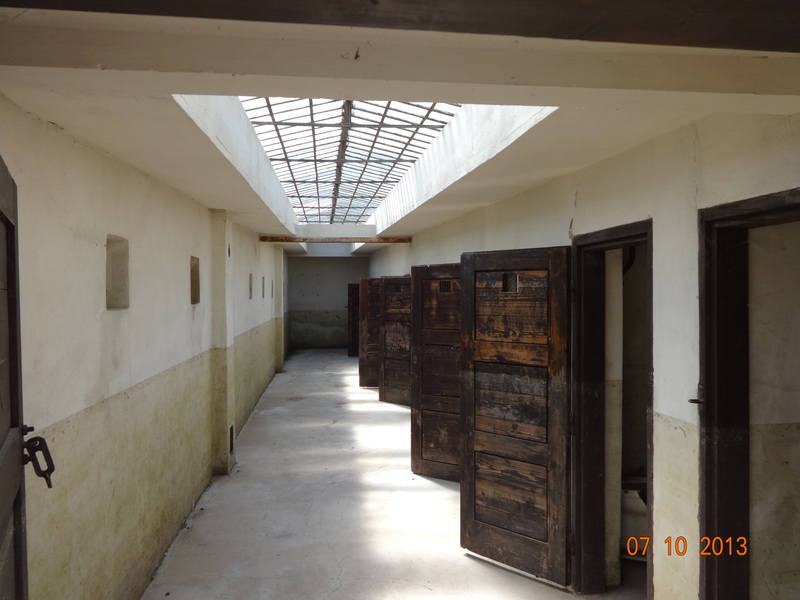 Prison. No, the two toned wall color is not on purpose. Evidence of recent floods. Note also cell doors. Inside the Small Fortress. 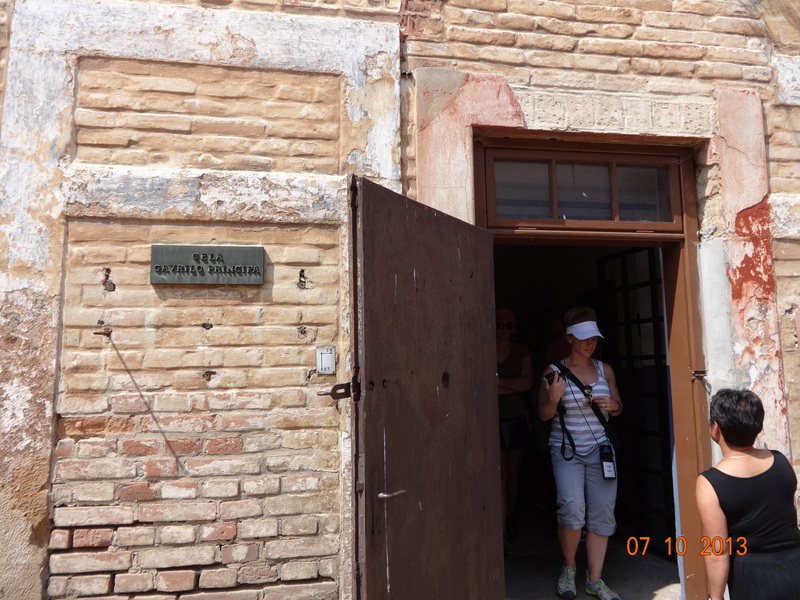 Gavrilo Princip, whose shots ushered in WWI, died here in Cell 1 in 1918. Inside the Small Fortress. 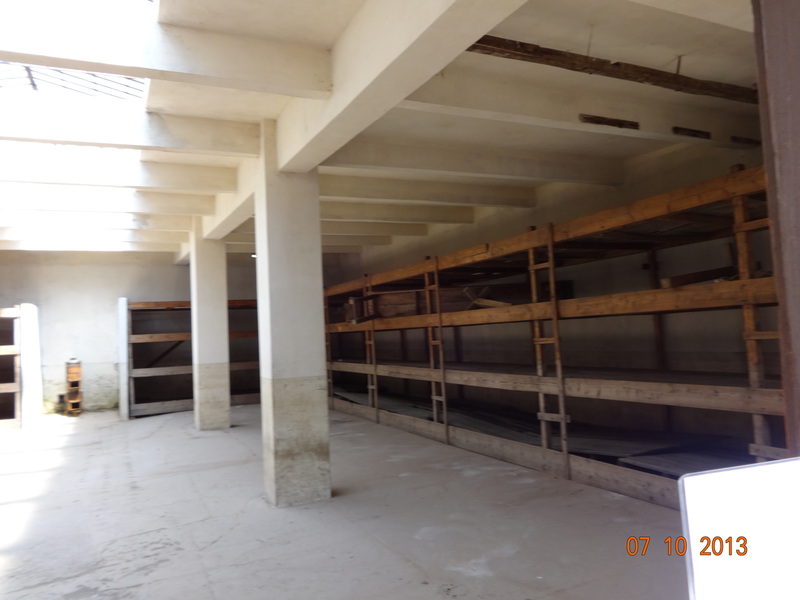 Barracks where many succumbed. Again note high water mark. And now, we move onto the former garrison town which became the ghetto. 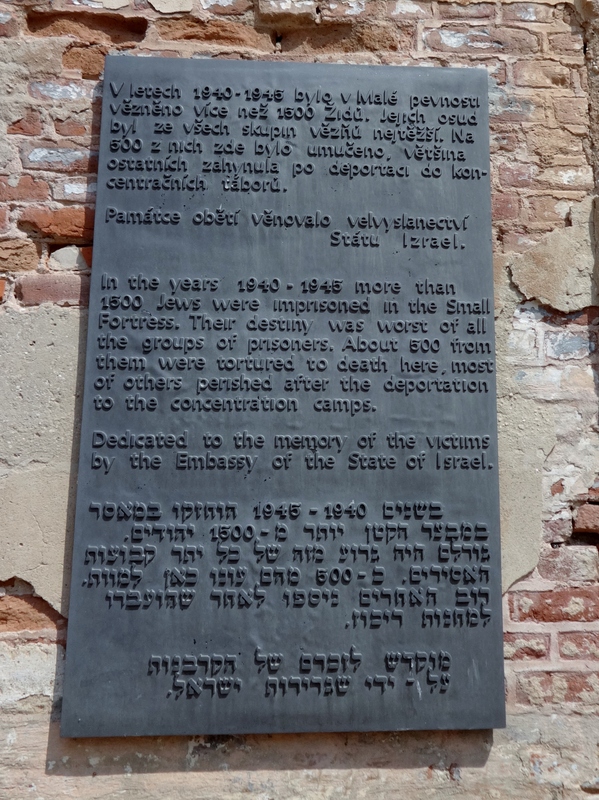 1) First, Theresienstadt served as a transit camp for Czech Jews whom the Germans deported to killing centers, concentration camps, and forced-labor camps in German-occupied Poland, Belorussia, and the Baltic States. 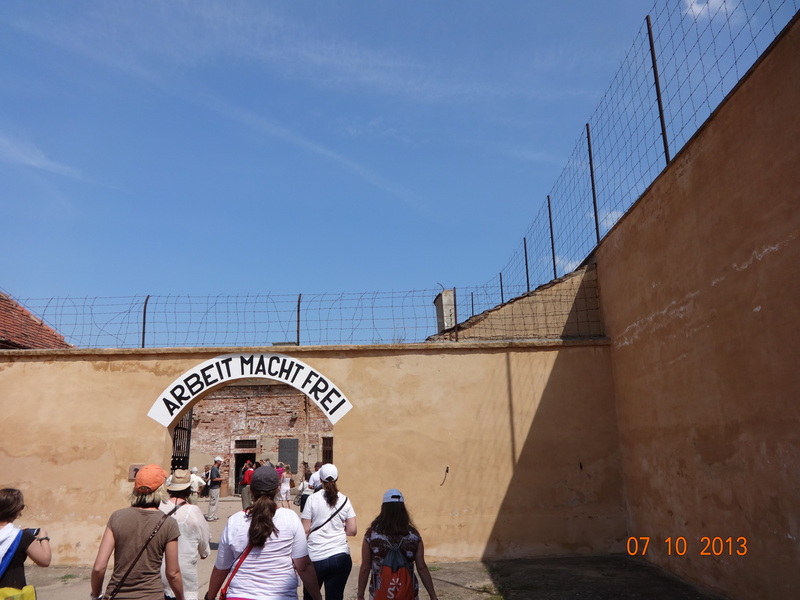 2) Second, it was a ghetto-labor camp to which the SS deported and then incarcerated certain categories of German, Austrian, and Czech Jews, based on their age, disability as a result of past military service, or domestic celebrity in the arts and other cultural life. To mislead about or conceal the physical annihilation of the Jews deported from the Greater German Reich, the Nazi regime employed the general fiction, primarily inside Germany, that the deported Jews would be deployed at productive labor in the East. Since it seemed implausible that elderly Jews could be used for forced labor, the Nazis used Theresienstadt to hide the nature of the deportations. Hundreds of thousands of people from all over Europe were deported here between 1942 and 1945. Most were shipped East to their deaths, though many also died in the wretched conditions here, so crematoria were established. 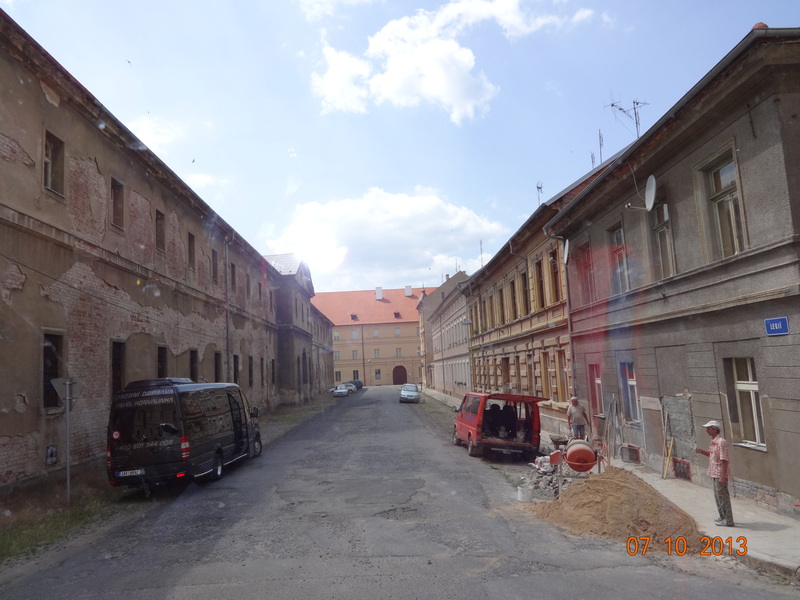 “Theresienstadt served an important propaganda function for the Germans. The publicly stated purpose for the deportation of the Jews from Germany was their “resettlement to the east,” where they would be compelled to perform forced labor. Since it seemed implausible that elderly Jews could be used for forced labor, the Nazis used the Theresienstadt ghetto to hide the nature of the deportations. In Nazi propaganda, Theresienstadt was cynically described as a “spa town” where elderly German Jews could “retire” in safety. The deportations to Theresienstadt were, however, part of the Nazi strategy of deception. The ghetto was in reality a collection center for deportations to ghettos and killing centers in Nazi-occupied eastern Europe. Smiling children during the propaganda visit. Most were sent on to their deaths afterwards. USHMM. 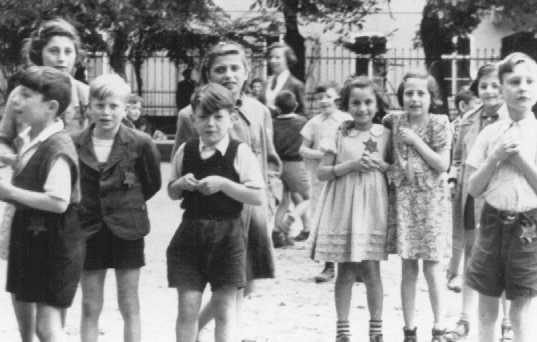 Fifteen thousand children passed through Theresienstadt. 90 percent were murdered. 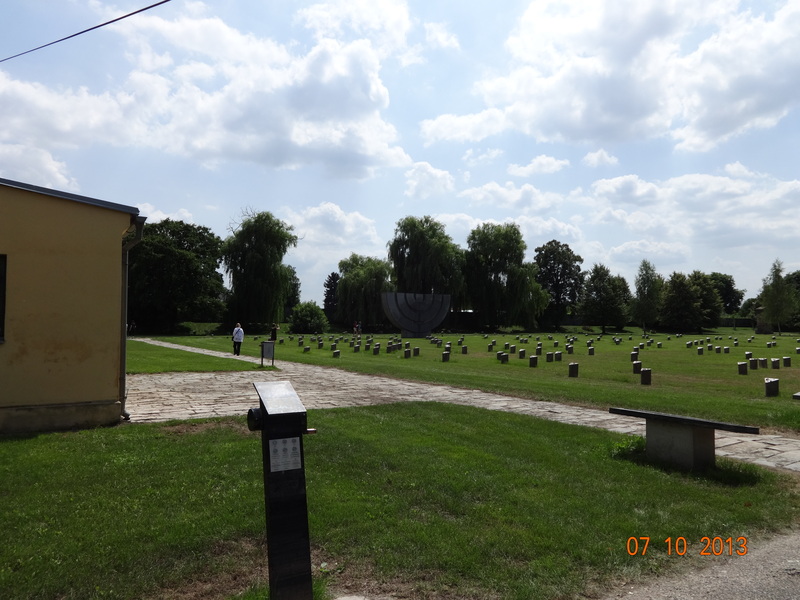 Crematoria building and burials, memorial. On May 5th, the Fuhrer dead nearly a week, the Soviets approaching, the guards left. On may 8th, the last day of the War, the Red Army arrived. We light candles. So we wind up our day, like all visits, with a group prayer for the dead and with solitary reflection for the living. We quietly make our way back to Prague, where life goes on. People hurry about their business on the streets. But step lightly, lest your stride be interrupted, so that you must pause and look down. 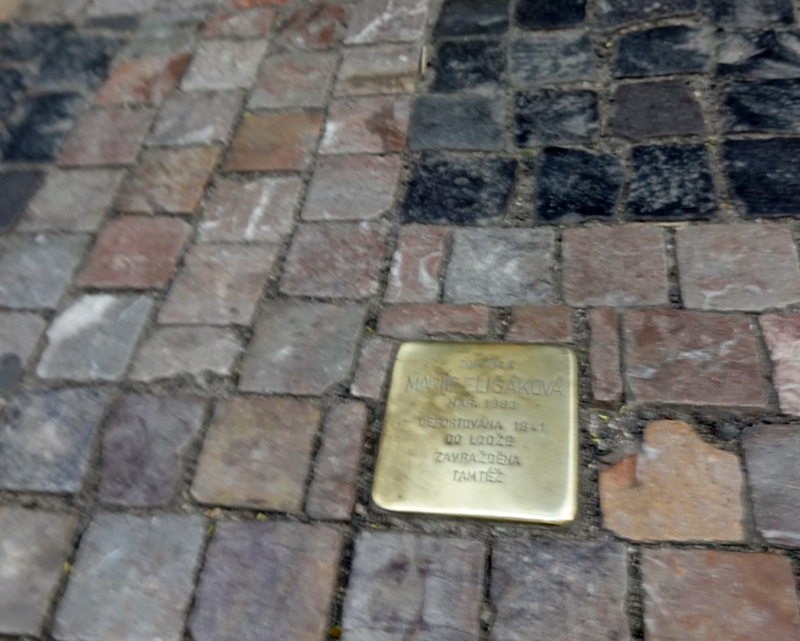 Then you may see the brass “stumble stone” embedded in the sidewalk with the engraving noting the former occupant of the dwelling here was deported to his/her death. Prague. Stumble stone. Which is not stone at all, but will make you wonder. Life goes on. But stop and wonder. Love your posts Matthew. Keep up the great work! Have a friend in Dayton (originally from Berlin) who lost his grandma at Theresienstadt. Within the last year I was in email contact with Wolf Murmelstein, whose dad, Benjamin, was the last Jewish Elder of the place and the only one to survive WWII. Guess there is a documentary out about Benjamin entitled “Last of the Unjust.” Fascinating story, replete with nigh inconceivable irony and tragedy. Hard to believe, but for Wolf (who was 6 or 7 I think when they were sent from Vienna to Theresienstadt) it was a relief to be amongst “his own people” and removed from the persecution he experienced in Vienna growing up.